Can I include a TV in my screened porch? 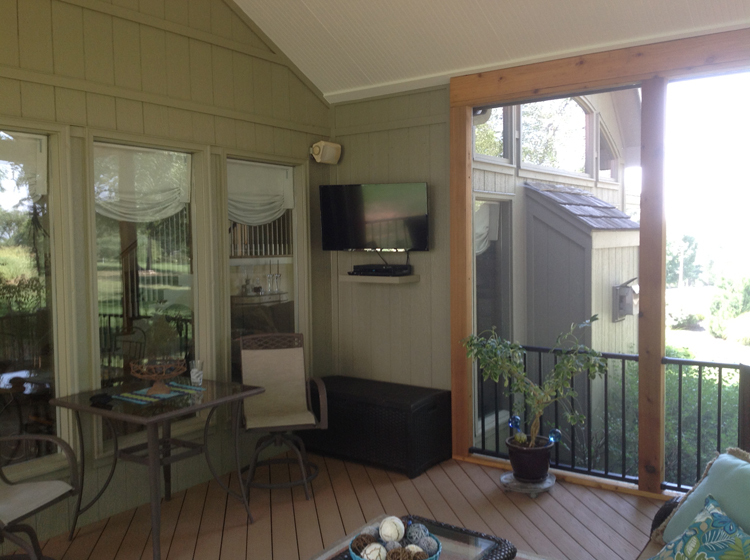 Adding large screen TV’s to porches is becoming more and more popular here in the Kansas City metro market. Homeowners want to get a lot more use out of their screened porch than they can get out of other outdoor living areas such as their deck. The addition of creature comforts such as outdoor TV’s and outdoor fireplaces is one way to have outdoor living with some of the interior amenities we’re used to. The whole outdoor living trend encourages people to do more indoor activities outside. What are the logistics of having a TV on your screened porch? The first item to consider is a power source. You will need electrical run to the area where the TV is mounted. The next consideration is placement. You will want to mount the TV away from the screened area. It shouldn’t be in an area where water may blow in. There are outdoor rated TV’s but at this point, they are still very expensive. They can be several times more expensive than indoor TV’s. There are other options. Some of our clients tell us they take their TV’s in for the winter but others tell us they leave them out year round. The final consideration is installation. 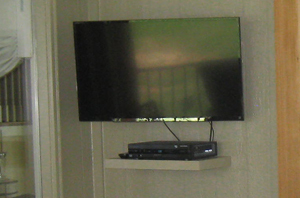 For our clients, we help with running the wire, installing the brackets, and installing the TV. 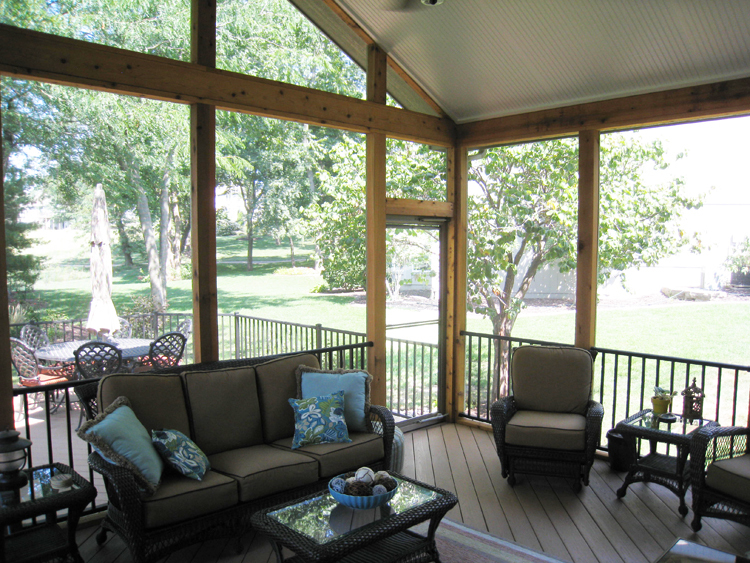 At this particular home in Lenexa KS, the homeowners wanted both a deck and a screened porch. They had an old deck that was beaten up and really wanted an enclosed space as well as a new deck. They wanted low maintenance floors and railing to reduce the overall maintenance required for both the deck and the porch. We tore down everything they had because they wanted to change the layout, size, and shape of the space. 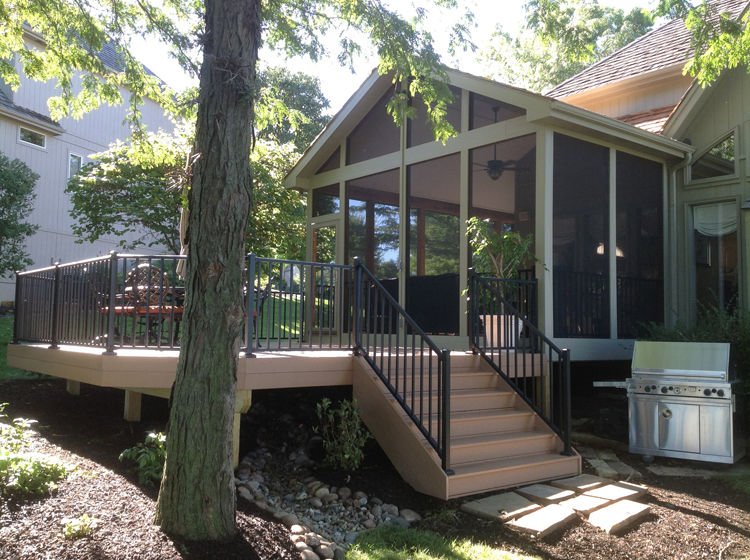 We created a new space, added a new gable roof, and then built a new deck attached to the porch. The deck is all made with AZEK low-maintenance PVC decking. This deck has black aluminum railing by Westbury. The dark colored and slender profile pickets allow excellent visibility beyond the deck. If you are considering adding a new outdoor living space, give us a call for a free consultation. We look forward to hearing how you want to live in your outdoor space and in working with you to design your ultimate outdoor living space. This entry was posted in Outdoor fireplace, Outdoor TV, Porch amenities, porches, Screen Porches on September 12, 2013 by archadeckkansascity.